Materials for construction of food equipment and auxiliary system equipment. Resistance to corrosive action of foods or chemicals that may interact with contact surfaces of construction materials like cleaning and sanitation agents. Suitable surface finish: excessive surface rugosity can generate buildup of dirt; the presence of smooth finish can also improve hygienic appearance and external aesthetic of process equipment. Good mechanical behaviour according to performance of mechanical functions such as structural strength, resistance to abrasion and physical or thermal shocks, and pressure loads. Forming of materials into desired shapes, into undulated surface sheets (e.g., plate heat exchangers), sheets and plates, rods, pipes, elbows, etc. Easy assemblage and fastening operations using common methods (welding, screw threads, etc.) not requiring special techniques. AISI 304 and AISI 316 Stainless steel are the most commonly used. Before the use of stainless steel, copper (food processing tanks and pipes) and iron with tin coating layers applied as a varnish over was used to improve corrosion resistance (e.g., inside tin cans). Although some engineering plastics may have many good qualities which make them suitable for use as construction materials for process equipment in direct contact with food, plastics usually do not usually have the durability of stainless steel. No. 1D finish. It is used in industrial applications requiring heat or corrosion resistance without surface polishing requirements. No. 2D finish. For surfaces requiring polishing after construction and equipment assembly. No. 2B finish. For surfaces easier to polish than the previous 2. No. 2G finish. A coarse but uniform finish, generally obtained using abrasive belts and grits. Usually applied to hot rolled material and generally not to material under 2.5 mm thick. Often used to recover a rough surface prior to further polishing or texturing. This coarse finish can lead to tears and laps in the surface layer, resulting in potential corrosion problems due to localised oxygen starvation, which prevents the formation of the natural protective oxide film that endows stainless steel with its corrosion resistance. Typical uses include food processing equipment, scientific apparatus and brewing equipment. No. 2J finish. A semi-dull finish with a uniform grain generally applied to the supplied surface of the mill finish stainless steel. No pre-grinding is involved, so only the smoother mill finishes such as 2A or 2B can be used. This finish is obtained using a bristle type brush or fine abrasives. It is used where a dull, but even, finish is required and where appearance is not critical. For surface finishes commonly used on restoration equipment, in dairy industry, and food industry in general. A fine satin finish with a smooth texture. It is produced using fine abrasives and a special cutting compound, giving it a clean, smooth “wet” cut surface. The smooth surface ensures minimal entrapment of surface debris from polishing or in use, making it suitable for most applications, especially architectural and catering uses. It is also easier to clean due to its long, shallow grain and less prone to staining in external or critical applications. The finer grain blends more easily after fabrications than coarser finishes which require more physical effort. The “wet” cut abrasive system ensures a high degree of consistency from sheet to sheet and grit size can be adjusted to maintain the correct levels of roughness and reflectivity. This finish has a pleasing appearance and is pleasant to the touch, making it suitable for a vast range of products or components. Typical uses include catering equipment, lifts, shop fronts, architectural panels, restaurant equipment, control panels and luggage handling equipment. No. 2P finish. A bright reflective finish which is achieved by bright buffing using a soft mop and suitable polishing compound. The process involved no pre-grinding and, as such, relies on the material having a good, defect-free surface. This type of finish will not remove surface defects but is essentially an enhancement of the mill surface. This finish is generally more reflective than the bright annealed finish but the degree of brightness or reflectivity may vary according to application or cost considerations. Mainly for surfaces in architecture, but also for food equipment, pumps, and valves. A mirror finish. General corrosion. General corrosion is a uniform attack of the entire metal surface. It is the least dangerous because rates of corrosion can be measured and predicted. Stainless steel have very low general corrosion rates in many aggressive environments. Indicates a more resistant stainless steel should be used. Erosion/Abrasion Corrosion. Erosion/abrasion corrosion is a combination of mechanical and corrosive attack. Abrasive particles in suspension, or high velocities, expose fresh metal surfaces which then suffer high rates of corrosion. Stainless steels offer a high resistance due to the tenacious and stable passive film on their surface. Intergranular corrosion. Intergranular corrosion is due to the formation of chromium carbides at high temperatures (450°-859°C). These form preferentially at the grain boundaries thus reducing the chromium content and resulting in a path of lower corrosion resistance around the grains. With correct choice of material (“L” or stabilised grades) and care during fabrication this form of corrosion should not occur. This type of corrosion penetrates through the crystallized grains. Stainless steel with low carbon content should be used, for example AISI 316 L, instead of AISI 316 and 304 L substituting for AISI 304. Pitting Corrosion (PT). Pitting corrosion is a dangerous, very localized form of corrosion which results in small holes or perforations through the material, with little measurable general metal loss. Some corrosive environments (commonly those containing the aggressive chloride ion) have the ability to attack localized weak points in the passive film. Due care in the selection of material should be taken if aggressive (e.g. 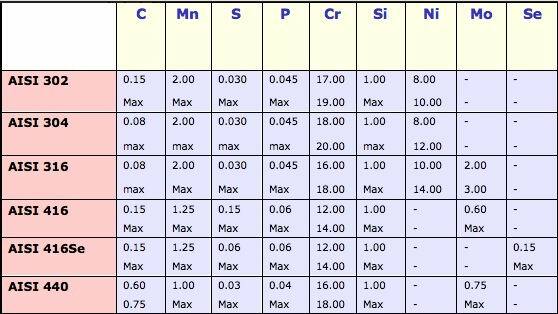 chloride) ions are present, especially in acidic solutions at elevated temperatures. If conditions which promote pitting corrosion cannot be modified, materials with higher alloy content such as the duplex stainless steels , having a two-phase microstructure consisting of grains of ferritic and austenitic stainless steel, and the stainless alloys will often provide a suitable solution. PT can be caused by metallic surface fouling, and it can be reduced by maintaining clean surfaces. Contact of metallic surfaces with chlorine products for an excessive time may also cause corrosion and spots. Both pitting and crevice corrosion can lead to SCC under certain conditions. Stress corrosion cracking is a brittle fracture occurring in an otherwise ductile material. the presence of a particular ion, like the chloride ion. Although it is difficult to quantify the exact chloride concentration needed, localized concentration of chlorides may initiate SCC. The austenitic crystal structure is prone to SCC whereas the ferritic crystal structure prevents its development. SCC is a process where initiation step may take considerable time: however, once the pit has developed, it acts as a local stress raiser, like a crack: the pit yawns open and fresh electrolytes reach the anodic tip of the pit. Corrosion occurs locally at the tip of the pit where further yawning and possible branching may occur. Eventually, the progress of attack reaches such a degree that the yield stress of the material is exceeded due to the residual of sound material. High resistance to SCC is obtained by use of duplex stainless steels, stainless alloys and super ferritic stainless steels. Galvanic corrosion. Occurs when two different metals are placed in contact; an electrical potential is created on the surface due to differences in concentration of conducting fluid. This can be solved using only one type of stainless steel in food equipment construction. Another solution is to ground the equipment to avoid the presence of an electric potential. Stainless steel can be made to be corrosion resistant if some precautions are observed during manufacture and installation of the food equipment in the process system, equipment design, and operation and maintenance of equipment. Using two different metals for the construction of equipment containing an electrically conducting fluid (a liquid food for example) in contact with both metals, an electric potential may results between the two metals. The resulting galvanic action between differentially charged metals can cause one of the metals to dissolve into the conducting fluid and deposit on the other metal, as if the different metals form an electrolytical pile. The current quantity depends on the metal types and electrolyte (substances dissolved in conducting fluid) characteristics. AISI 302 stainless steel, less expensive, is sometimes used to improve the external design appearance of food equipment, but not equipment in contact with food or corrosive agents. Under special corrosion conditions, such as in the presence of acidic fluid foods or foods containing SO2, AISI 316 or 316L stainless steel is preferable to AISI 302 or AISI 304. The corrosion resistance of stainless steel when exposed to air is due to the spontaneous formation of a layer of chromium oxide (self-passivation) on the surface of the material as a protective coating. A treatment of the surface with nitric acid (20–30% at 60°C) for about 30 minutes can form an artificial layer. The aggressiveness of food on equipment construction materials depends on temperature, food rugosity (abrasiveness), contact duration, pH, and flow velocity. Knowing these aspects, the corrosion of stainless steel (from chlorides for example) of the jacketed tank heated by steam used to process salt containing sauce, can be reduced for example by delaying the addition of salt during heating (as much as possible). The most corrosive food products are those containing vinegar, salt, or more acidic products like citric acid (lemon juice): in these cases, AISI 316 stainless steel is the most suitable material. In general ,the most corrosive chemical products are hypochlorines, but in typical concentrations used in food industries there is no danger of stainless steel corrosion. Maintenance of brine pH between 7.5 and 8.0 is also recommended, otherwise corrosion may appear. It is used because of the high thermal conductivity, (217 W/m.K) , and reduced specific weight (2700 kg/m3) if compared with steel. Aluminum is corrosion resistant under normal conditions, for example during the distillation of water, milk, fruit juice, and in the presence of SO2, but it is not resistant to corrosion like stainless steel, and moreover it shows limited resistance to abrasion during cleaning, use of sanitization products and contact with food product. This is why aluminum is now seldom used. Alkali products can not be used with this material as it is not resistant to attacks by hydrochloric and hydrofluoric acid or caustic solutions: acid cleaning agents are appropriate for aluminum. Nowadays, aluminum is used only in the construction of some specific parts of food processing equipment.